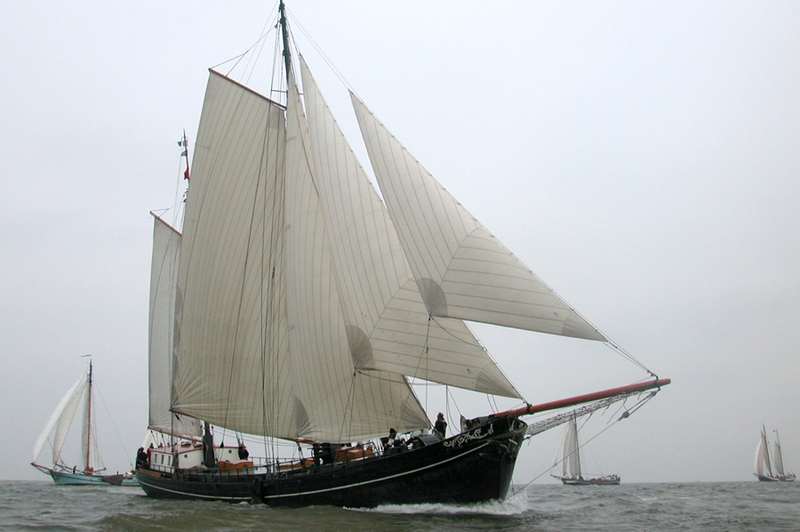 The Aldebaran is a fast and comfortable two-mast clipper. 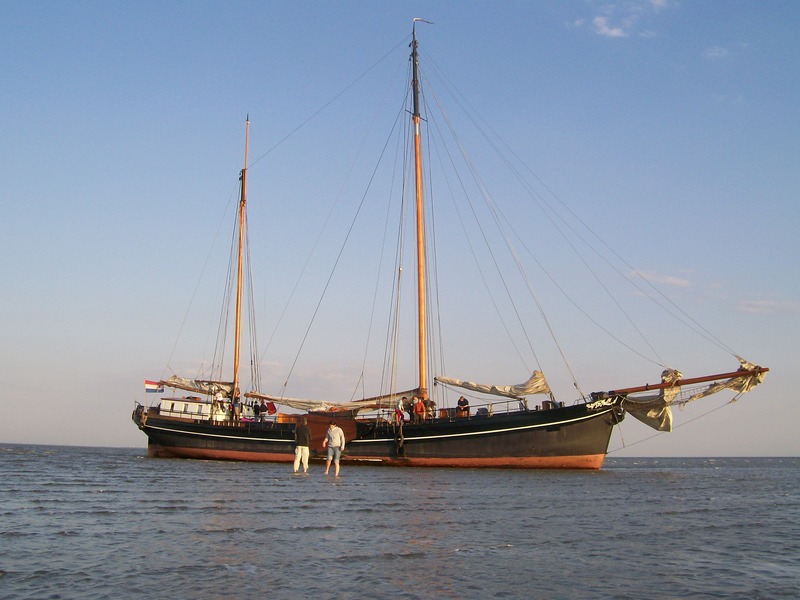 The 36-metre long sailingship was built in 1893 as a two-mast river clipper. 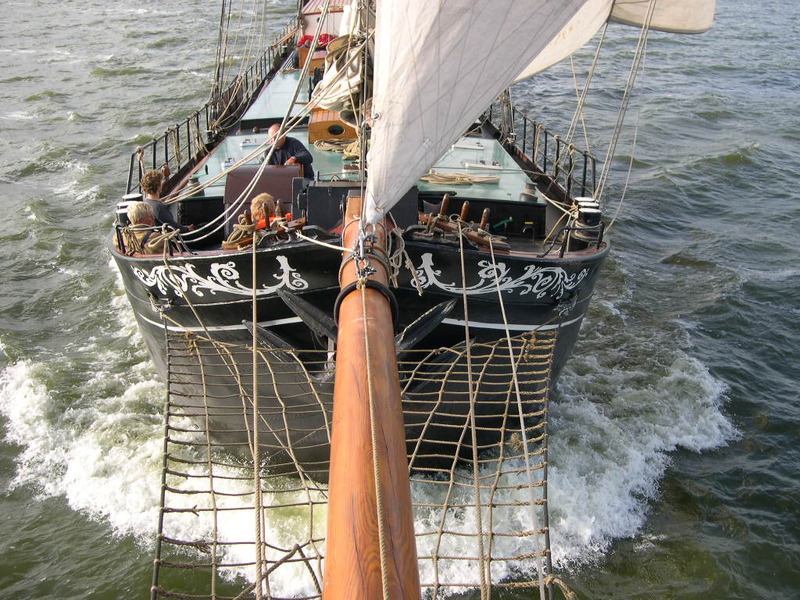 The traditional look of the ship has been preserved; the sailingship has a beautiful sheer and a rounded bottom, indicating that it is a fast sailer. 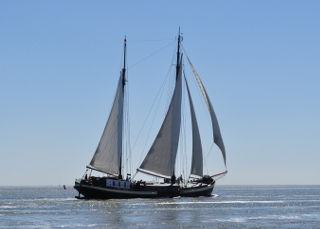 The Aldebaran is the perfect ship for a lovely sailing trip across the Shallows of the Wadden Sea Lake or the IJsselmeer Lake. 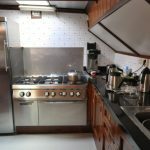 For an overnight stay, the Aldebaran offers accommodation for 30 persons. 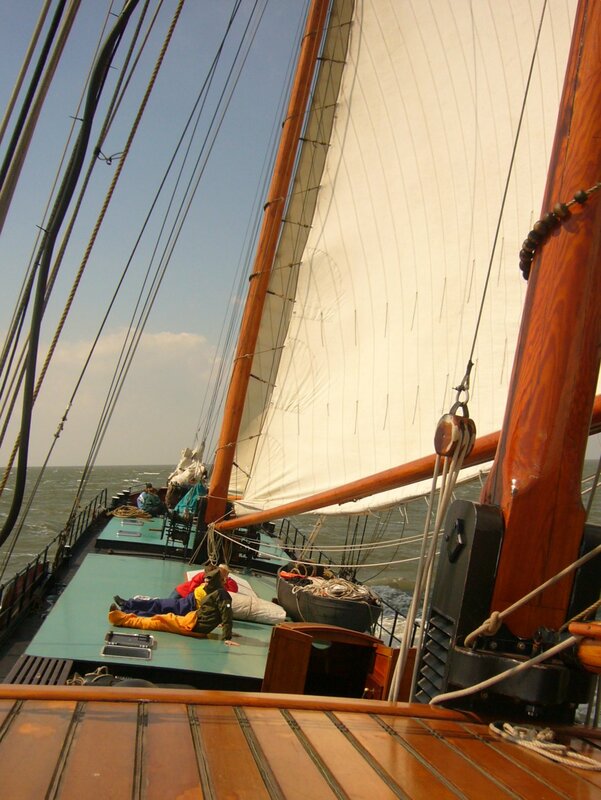 During a day trip there is room for a maximum of 50 passengers on board. The Aldebaran is moored in Willemshaven harbour in Harlingen. This is also the boarding site for the sailing trips. The current position of the Aldebaran can be found here. 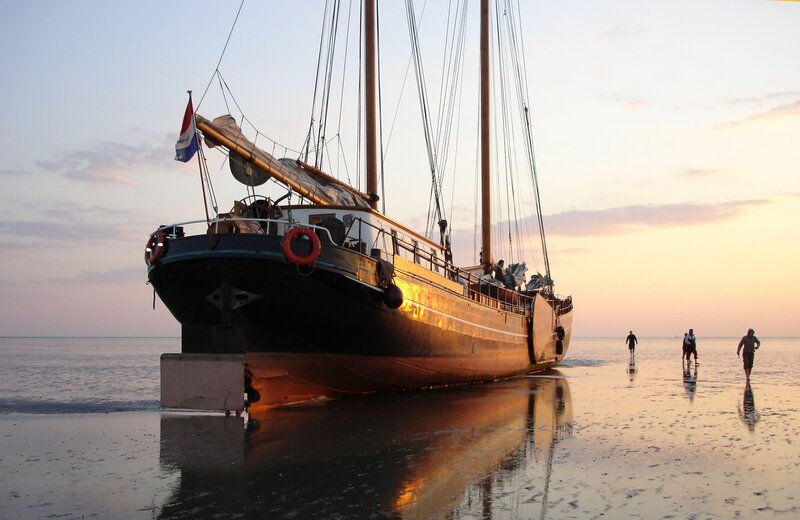 The former hold of the Aldebaran has been converted and fitted with a cosy and comfortable interior. 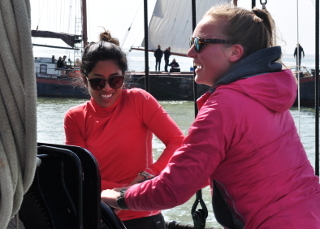 The saloon offers you the opportunity to relax, rest and sit down after a long sailing day on the water of the Wadden Sea Lake. 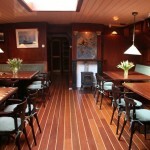 The spacious saloon offers room for many passengers in a great ambiance. It is possible to eat, play games and so on together. The Aldebaran has three two-person cabins and six four-person cabins. 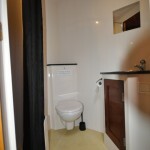 All four-person cabins are equipped with an en suite bathroom. 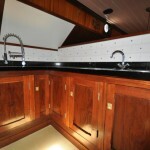 Two of the two-person cabins share one bathroom. 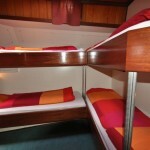 All cabins have floor heating and each cabin has at least two power sockets. The beds are equipped as standard with fitted sheets, pillows and pillow cases and duvets are available for the weekend grouptrips. 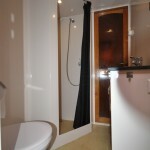 The cabins have a bathroom, which is fitted with a shower, toilet and sink. 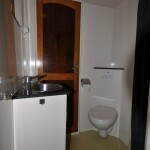 There is one two-person cabin with a small bathroom, equipped with a sink and toilet. 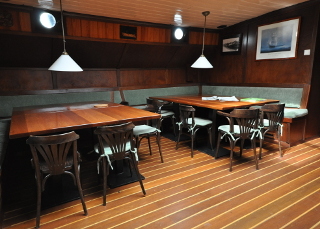 Above deck there is a comfortable seating enclosure with cosy sofas. 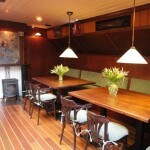 But during (group) trips the rest of the deck can easily be used as sun deck. 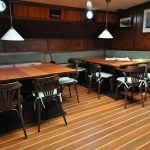 The deck is easily accessible: it has no high steps or protruding parts. There is more than enough space on board. The prices below are for the maximum number of passengers and include booking costs, a 2-man crew, port dues, tourist tax, final cleaning (and complete bed linen weekends only). afternoontrip from 12 a.m. – 6 p.m. 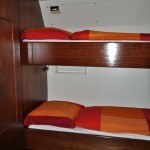 The two upper beds in the 4p cabins can be folded away, creating a spacious cabin 2p. 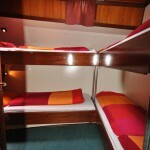 We offer 2 extra beds for groups, an extra bed costs € 80 p.s. The history Aldebaran you will find it here.